Cannily plays in equal measure to the sci-fi TV crowd and families, to red states and blue states, and it's a formula—refined in Season Two—that seems to be working. 450 min. TNT. Directors: Greg Beeman, John Dahl, Michael Katleman, Miguel Sapochnik, Holly Dale, Seith Mann, Adam Kane. Cast: Noah Wyle, Drew Roy, Connor Jessup, Maxim Knight, Moon Bloodgood, Will Patton, Seychelle Gabriel, Collin Cunningham, Sarah Carter, Peter Shinkoda, Mpho Koaho, Ryan Robbins, Jessy Schram, Dale Dye, Matt Frewer, Terry O'Quinn. Executive-produced by Steven Spielberg, TNT's Fallen Skies at times feels like a mash-up of Saving Private Ryan and War of the Worlds. From the former, Fallen Skies gets creator Robert Rodat (Oscar nominated for his Saving Private Ryan screenplay) and its emphasis on people from all walks of life drawn into military service. From the latter, the show gets alien invasion tropes including creepy-crawlies, slime, robotic death-squads, heavy artillery, explosions, and an emphasis on the family unit in crisis. Functionally, though, Fallen Skies resembles nothing so much as a post-apocalyptic tale like The Walking Dead: a close-knit group wandering blown-out America in search of other survivors and, they hope and pray, civilization reborn. Taking over single-dad duties from Tom Cruise is Noah Wyle (of the Spielberg-produced ER). Wyle plays former history professor Tom Mason, who plays a key role in the human resistance to aliens attempting to wipe out our species. Tom, teenage sons Hal (Drew Roy) and Ben (Connor Jessup), and nine-year-old son Matt (Maxim Knight) travel with "the 2nd Massachusetts," a hybrid of civilian militia and family that alternately evades and takes the fight to the alien invaders. Those come in two flavors: six-legged, scaly "skitters" and robotic "mechs" with built-in firepower. The skitters have a bad habit of "harnessing" children into slave labor: Ben's a survivor of the process with ongoing concerns about the lingering effects of the harness (which could only partially be removed). Ben's psychic link to the aliens has obvious disadvantages—like the dubious safety of humans living alongside him—but also advantages to his physical strength and sensory acuity. 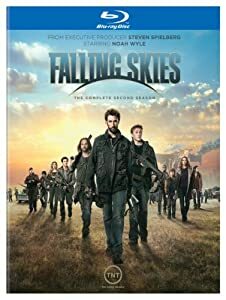 Falling Skies cannily plays in equal measure to the sci-fi TV crowd and families, to red states and blue states, and it's a formula—refined in Season Two—that seems to be working (unlike Spielberg's other recent TV efforts, like Terra Nova and Smash, which have gone the way of the dodo). Sci-fi vets like executive producer Greg Beeman (Smallville, Heroes) and co-executive producer Mark Verheiden (Battlestar Galactica, Caprica) guide the doled-out series mythology with a sure hand, while steadily doing service to family-values relationship lessons, warm fuzzies to add hope to a post-apocalyptic narrative. It's a show the Tea Party could love, with the repeated historical allusions to the American Revolution and a "well-regulated militia" that effectively justifies the 2nd Amendment each week. Still, liberals can feel free to read in a just-deserts moral of Americans coming to understand what it means to be occupied (plus, the notion that "the only good skitter is a dead skitter" comes into serious question in Season Two). Season Two refines the series' pacing and plotting over its batch of ten episodes. Production values have been kicked up a notch (so much that one might hardly notice the clever "bottle show" "Death March," which takes place almost entirely within on-the-road vehicles), and more time is afforded to the most interesting characters (though one unfortunate flaw of the series is how it shafts token African-Americans and Asians instead of writing them interesting characters). Will Patton sometimes succumbs to corny scriptwriting, but this in-demand film actor makes his Captain Weaver indispensable, and Colin Cunningham brilliantly keeps us guessing as nasty "Berserker" John Pope. Wyle and Moon Bloodgood (as resourceful field doctor Anne Glass) make a likeable, sensitive but strong central couple, and Connor Jessup grows into his increasingly complex role as a human-alien hybrid in this second season. The late-season addition of Terry O'Quinn—in a Walking Dead-ish plotline—is welcome; hopefully he'll stick around for a while to make Tom's life more complicated. Warner should make Falling Skies fans very happy with The Complete Second Season on Blu-ray. A/V credentials are excellent: I can find nothing to complain about in the picture quality, which is rock-solid from start to finish in terms of detail (even in the frequent dark scenes, which were most likely shot "day for night"). Color is pleasing, and all around, the picture is clean, clear, and tight. The audio is every bit as good, in Dolby TrueHD 5.1 that's a definitive presentation: the front-and-center dialogue is always nicely prioritized and clear, but rear channels are surprisingly boisterous, especially in the action sequences. Bonus features add plenty of value. Disc One kicks off with an audio commentary on “Worlds Apart” by Noah Wyle, co-executive producer/director Greg Beeman and writer Mark Verheiden. "One Page at a Time: Writing the Second American Revolution" (20:49, HD) offers the screenwriting perspective. "The Fan’s Perspective: Touring the Set of Falling Skies" (8:59, HD) is a cool featurette showing fans (mostly South American contest winners) getting a tour of the set. They're excited to meet the actors and Beeman, watch filming, and play with skitter parts. "Terry O’Quinn is Manchester" (1:46, HD). This extra is unfortunately misplaced on Disc One, as the character doesn't appear until the last two episodes of the season, so a first-time viewer won't want to watch this until after viewing the whole season. Behind-the-scenes pre-production and production detail come out in the self-explanatory "Creating The Crawlies" (1:12, HD), "Designing The Spaceship" (1:23, HD), as well as "Team Skitter" (2:48, HD), which introduces us to the puppeteers and animatronics experts who perform the skitters. Rounding out Disc One is the "Season 2 Animated Trailer — Created by Dark Horse Comics" (1:13, HD), which also doubles as a promo for a webcomic prequel to the season. Disc Two includes audio commentary on “Homecoming” by Wyle, Beeman and executive producer Remi Aubuchon, as well as audio commentary on “A More Perfect Union” by Wyle, Aubuchon, and writers Bradley Thompson and David Weddle. "The Skitter Evolution" (9:47, HD) details the refinement of the presentation of the skitters. "2nd Watch - Episode 20: A More Perfect Union" (30:58, HD) is an episode of the Falling Skies internet "after-show" 2nd Watch, hosted by celebrity fanboy Wil Wheaton. The roundtable focused on the season finale 9and speculation about Season Three) includes Wyle, Aubuchon, Moon Bloodgood, Drew Roy, Connor Jessup, Maxim Knight, Sarah Carter, and Seychelle Gabriel. It's only a pity that just this one is included in the set, but the rest of the 2nd Watch episodes remain readily available on the internet. "Season 3 Preview" (2:20, HD) is a decent little tease that includes some interview clips with Beeman and a few of the cast; we also see a bit of the filming of the third season. All site content © 2000-2019 Peter Canavese. Page generated at 04/18/2019 12:40:03AM.